Pony Camps are, to children and adults alike, an important part of learning to ride consisting mainly of riding and stable management(the care of horses). Participants are allowed to help with the day to day running of the yard, under supervision, and are allocated their own horse or pony for the duration of the camp. 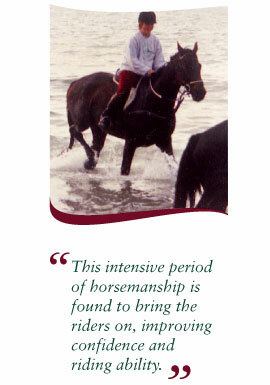 This intensive period of horsemanship is found to bring the riders on, improving confidence and riding ability. It is most important for riders to be able to understand the horse and how it needs to be kept and handled. Pony Camps are held during main school holidays for children and at weekends for adults. Residential and non-residential camps are available and children can stay in purpose built dormitories under the supervision of the instructor or the McMillan family. All meals are provided and in the evening entertainments such as visits to the swimming pool and cinema are organised. Trophies, rosettes and certificates are awarded at the End of Camp Presentation. We run specialised day trips to various forest parks and beaches for riders from the school and other experienced riders. These trips include hire of a horse or pony, transport, barbecue and refreshments.